The number of gun-related deaths among children age 15-18 rose 46 percent from 1,389 in 2013 to reach 2,025 in 2017, the most recent year for which data was available. The rate among those age 5-18 rose 34 percent during the same period, for a total of 437 of deaths in 2017 compared to 326 in 2013, according to the study published Thursday in the American Journal of Medicine. 'It is sobering that in 2017, there were 144 police officers who died in the line of duty and about 1,000 active duty military throughout the world who died, whereas 2,462 school-age children were killed by firearms,' researchers wrote. Experts at Florida Atlantic University's Schmidt College of Medicine analyzed data from the National Center for Health Statistics to reach their findings. Overall, 38,940 children age 5-18 years old died from gun violence from 1999-2017. A majority (32,478) were age 15-18, while 6,464 were children age 5-14. 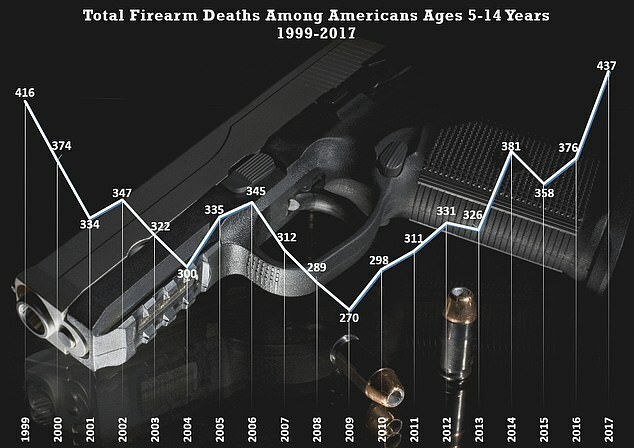 The problem has been worsening in recent years, following declines in youth gun deaths in the mid- to late-2000s, with upticks starting in 2013 among 15-18 year olds and in 2009 among 5-14 year olds. Overall, a majority (61 percent) were killed during an assault, while 32 percent died by suicide and 5 percent died in an accident. Details were unavailable on an additional 2 percent of cases. The numbers were more dire among black youth. While African Americans make up roughly 12 percent of the U.S. population, black children age 15-18 accounted for nearly 42 percent of all gun deaths among that age group in 2017. The number of black teens age 15-18 killed by guns rose 40 percent from 2013-2017 to reach 843 deaths in one year. Meanwhile, gun deaths among African Americans age 5-14 rose an average of 16 percent a year from 2013-2017. 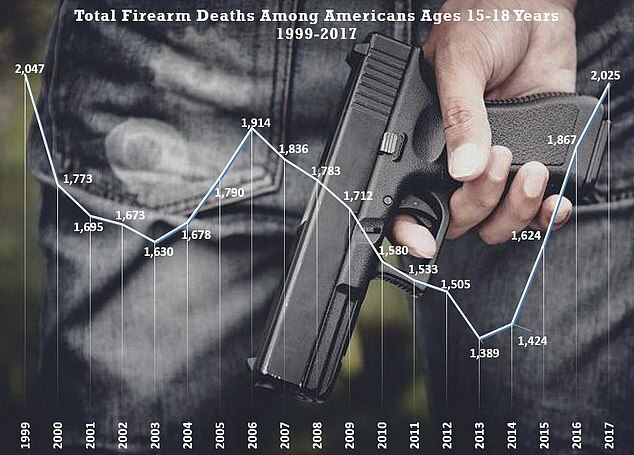 White teens also saw a dramatic upward trend: gun deaths among 15-18 year olds increased 67 percent from 2013-2017, to reach 1,110 deaths in one year. 'These descriptive data indicate that mortality rates from firearms in United States schoolchildren are increasing at alarming rates especially among blacks and those aged 15 to 18 years,' researchers wrote. With 393.3 million civilian-owned guns, the U.S. is the only country in the world that has more guns than people, according to a separate report by Small Arms Survey, a Geneva-based think tank. America has a population of 316.5 million, amounting to 120.5 firearms per 100 people.